Purple French Lace Designer Dream Wedding Garter Best Seller! A unique wedding garter with such lovely reviews! Gorgeous purple satin wedding garter trimmed with shaped lace. The lace is in a floral design with curved edges. This luxury garter is embellished by hand with hundreds of tiny toning beads, in petrol colours, purples, greens, blues and gold and droplets accentuating the points. Finished with triple bows and a crystals flower. This delicate wedding garter is a lovely choice for a bride, bringing a touch of luxury to match any Violet/ lilac/ purple bridal theme. 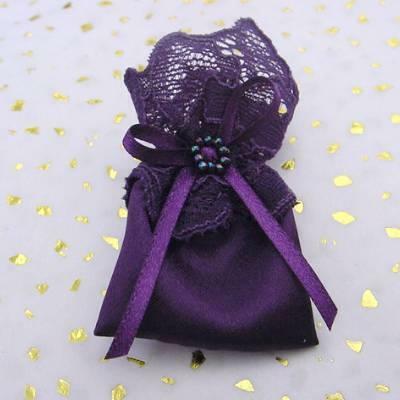 There is now a toss garter available to match. Because of the ornate design of this garter, they come sized and are designed to sit fairly flat on the leg. Excellent, prompt personal service. It was great to be able to discuss my order with someone before placing my order. The garter is absolutely lovely and beautifully made. The little blue bow and lucky sixpence are a fabulous idea. Can't wait to wear it.